Go to the blog archive and browse all previous blog posts we have published so far. Subscribe to the GovCERT.ch blog RSS feed to stay up to date and get notified about new blog posts. Subscribe to the whitepapers RSS feed to stay up to date and get notified about new whitepapers. WannaCry? It is not worth it! Microsoft patches three zero-day vulnerabilities - what does that mean to you? In July 2014, Trend Micro published a report about a threat called Retefe, an ebanking Trojan that is targeting financial institutions in Switzerland, Austria, Sweden and Japan. 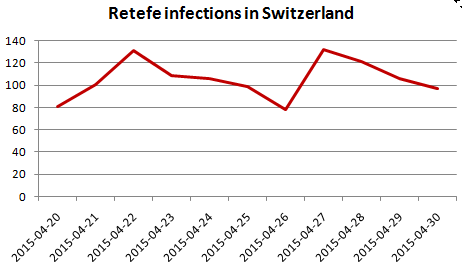 In fact, Retefe is already around since November 2013. Back then, MELANI already took appropriate action together with the affected financial institutions and ISPs in Switzerland to mitigate the threat. 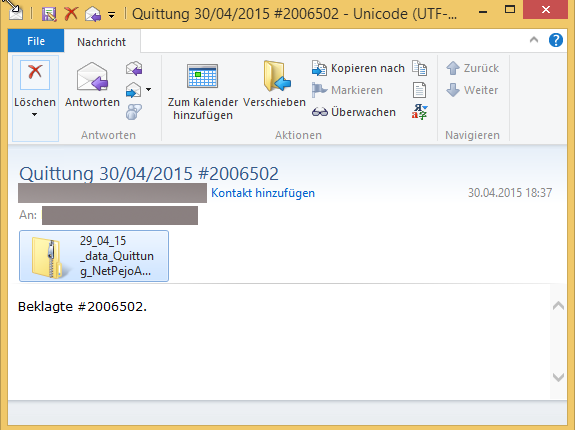 However, Retefe is still being distributed in recent spam campaigns, targeting Swiss Internet users. One of the most recent spam campaigns has been observed yesterday, where hackers spammed out emails to Swiss Internet users abusing compromised email accounts of well known email services providers, such as GMX. By using compromised email accounts, spammers and hackers are able to bypass DNSBL-based spam filters. The spam themes vary. 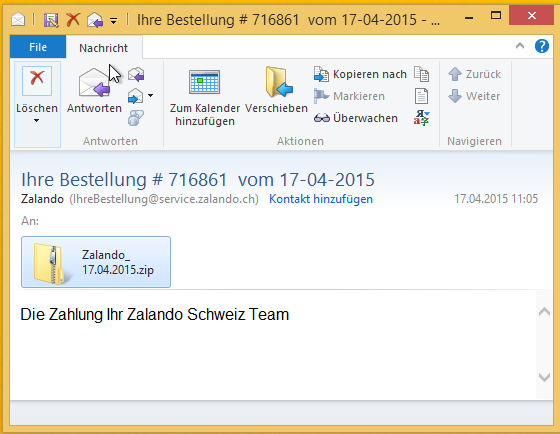 But two years after the first appearance of Retefe, the well-known online shop Zalando still appears to be their favourite brand to abuse, pretending to be an invoice coming from Zalando Schweiz. Fortunately, Zalando did its job and is publishing an SPF (Sender Policy Framework) record in their DNS, demanding that any email using the sender @zalando.ch or @service.zalando.ch needs to come from the Zalando mail servers. If the receivers mail server is configured correctly and checking the SPF record of the sending domain name, the SPF check for spam mails pretending to come from Zalando Schweiz will fail and the receiving mail server therefore rejects such spam emails at the boarder or scores them appropriately with a high spam score. 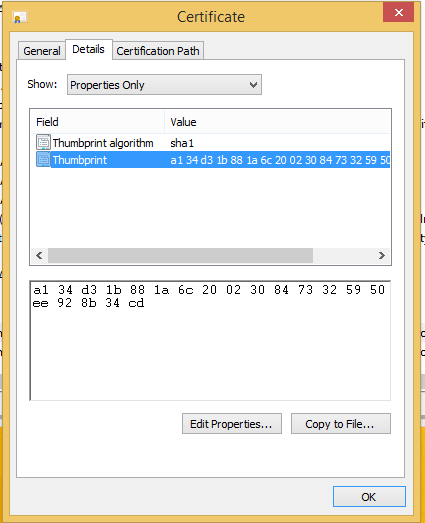 The spam emails usually come with a compressed attachment (ZIP), containing either a malicious RTF file with a .cpl file embedded or with an executable (.exe). If the user opens the attachment by executing the malicious .cpl or .exe file, Retefe is dropped to the victim's computer. While in 2014 Retefe was altering the DNS settings of the victims computer to use a rogue DNS server, the recent Retefe campaigns are taking advantage of a malicious web proxy server. To do so, Retefe will change the Proxy-PAC settings of the victim's machine in order to fetch a web proxy configuration from a rogue web server whenever the victim starts Internet Explorer. The URL, where Retefe fetches the web proxy configuration, varies in each campaign. 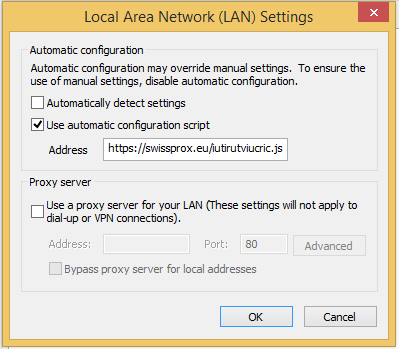 In the most recent version from yesterday, the proxy configuration is being fetched from swissprox.eu, which is hosted at FDCservers.net in the US and obviously has been setup by the hackers themselves for the exclusive purpose of hosting malicious proxy PACs. Using this technique, the hackers are able to issue any SSL certificate they like for any website and the victims web browser will accept it since the rogue CA is trusted by the victim's computer. The web browser is not going to display any security warning or similar to the victim. The victim will believe to be connected to the ebanking service of his bank. To summarize it: It hasn't much changed in the modus operandi of Retefe since 2014. Retefe is still using more or less the same themed spam emails to distribute itself in Switzerland. 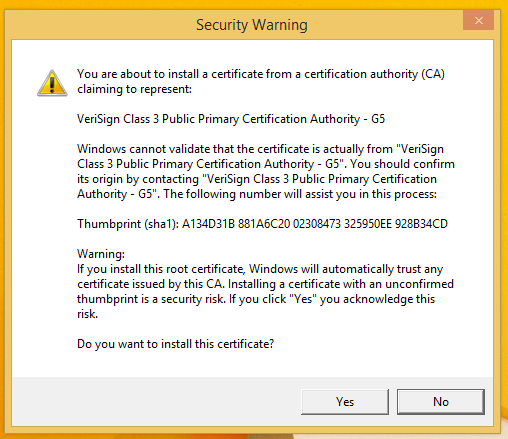 On the technical side, Refete is still using a rogue CA certificate to avoid SSL security warnings on an infected machine. However, Retefe moved away from altering the victim's computers DNS settings to using a malicious proxy configuration to redirect the victim to a fake ebanking portal. MELANI/GovCERT.ch closely monitors Retefe and takes appropriate actions together with the financial institutions and the ISPs in Switzerland in order to mitigate the threat as much as possible. If you operate a mail server, make use of Sender Policy Framework (SPF) and DomainKeys Identified Mail (DKIM). Check all incoming emails for PSF and DKIM records. In order to prevent attackers from abusing your own domain name, publish an SPF record with your responsible mail servers that are allowed to send email on your behalf. PS: When infecting a computer, Retefe fetches a PNG from a remote server using Windows PowerShell (in this case https://www.easycounter.com/counter.php?mvtyiortiyoxirt). This appears to be used for statistical purpose by the hackers. If you visit this URL through a web browser, you will see the number of computers Retefe has infected in this campaign (which is currently 58 on 1st May 2015).